This package includes 1 hour of circus activities in our gym filled with circus apparatus (circuit style), under the instruction and supervision of a minimum of two instructors, followed by 45 minutes in our newly built party room (refrigerator now available) for your needs (cake/gifts/snack). All birthday party bookings at Atlantic Cirque are private as we only book one group at the time! Extra participant $15 plus tax. This package includes 1 hour of circus activities in our gym filled with circus apparatus, under the instruction and supervision of a minimum of two instructors, followed by 45 minutes in our newly built party room (refrigerator now available) for your needs (cake/gifts/snack). All birthday party bookings at Atlantic Cirque are private as we only book one group at the time! Extra participant $15 plus tax. 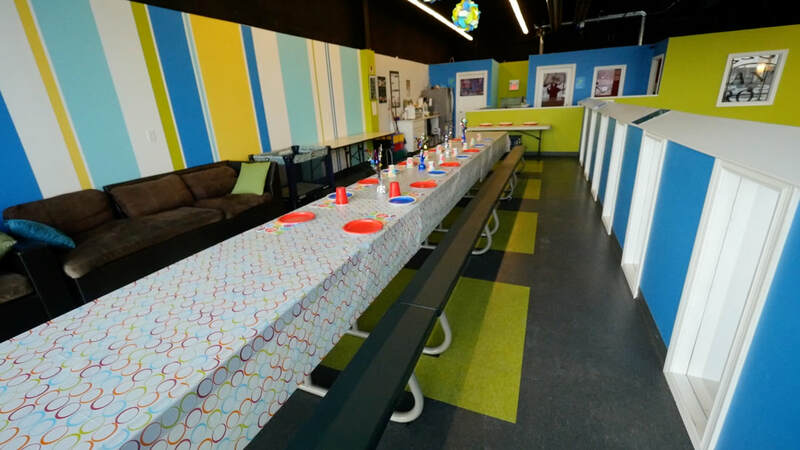 The "Classic" is our most popular birthday party package. It includes 1.5 hours of circus activities in our gym filled with circus apparatus, under the instruction and supervision of a minimum of two instructors, followed by 30 minutes in our newly built party room (refrigerator now available) for your needs (cake/gifts/snack). All birthday party bookings at Atlantic Cirque are private as we only book one group at the time! The "Cirque & Show" package includes 1.5 hours of circus activities in our gym, filled with circus apparatus, under the instruction and supervision of a minimum of two instructors, followed by a live 5min performance by our staff, and 30 minutes in our newly built party room (refrigerator now available) for your needs (cake/gifts/snack). All birthday party bookings at Atlantic Cirque are private as we only book one group at the time! The "Cirque & Crafts" package includes 2 hours of circus activities in our gym filled with circus apparatus, under the instruction and supervision of a minimum of two instructors, followed by a live 10mins of circus performances by our staff, 30 minutes of circus crafts (making juggling balls). Yes, they get to keep them! ), and 30 minutes in our newly built party room (refrigerator now available) for your needs (cake/gifts/snack). All birthday party bookings at Atlantic Cirque are private as we only book one group at the time! The "Cirque Extravaganza" package includes 2 hours of circus arts activities in our gym filled with circus apparatus, under the supervision of at least two instructors, followed by a live 10mins of circus performances by our staff, 60 minutes of circus crafts (making juggling balls). Yes, they get to keep them! ), and 45 minutes in our newly built party room (refrigerator now available) for your needs (cake/gifts/snack). All birthday party bookings at Atlantic Cirque are private as we only book one group at the time! Call or email us to book yours today. Don't wait too long, we get bookings months in advance! You can also book our professional photographer for your party, see details here. Do not wait too long to contact us, we are often booked months in advance! The parent / guardian of each participant needs to fill out a waiver form. ALL BOOKINGS REQUIRE A $50 DEPOSIT AND CONFIRMATION EMAIL TO SECURE DATE AND TIME. HST is not included in the above prices. to reschedule your party at a time and date that is convenient to you, your deposit will be refunded in full.